文獻來源：Wu, S and Z. B. Xie. 2019. 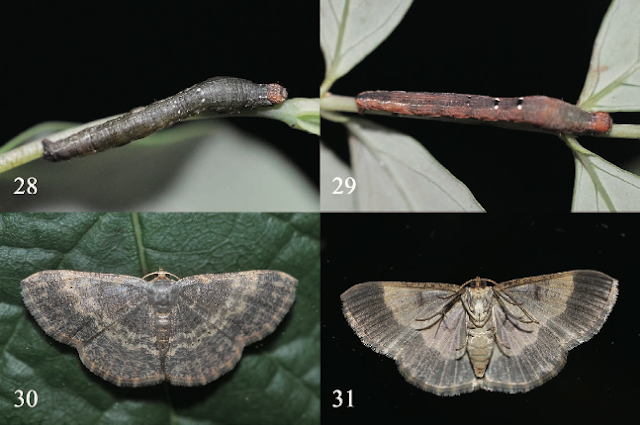 On the clarification of the species identity of Peratophyga Warren, 1894 of Taiwan, with description of a new subspecies (Lepidoptera: Geometridae: Ennominae). Tinea 24 (4): 226-232. The present study deals with the taxonomic identity of the Peratophyga Warren, 1894 taxon of Taiwan. After type examination and comparative study, the Taiwanese taxon is proved to belong to P. grata (Butler, 1879) but is somewhat different to the nominate subspecies and subspecies totifasciata Wehrli, 1923 in China based on the slight larger wingspan size, the features of female genitalia and known larvae. The new Taiwanese endemic subspecies, P. grata stuningi ssp. nov., is described. [文獻出處] Wu, S. and S. H. Yen. 2019. Evaluating the generic definition of Lithopolia Yoshimoto, 1993 with a description of one new species of Taiwan (Lepidoptera, Noctuidae, Noctuinae, Orthosiini). Zootaxa 4555 (3): 425–432. The present study evaluates the relationships among the Orthosiini genus Lithopolia Yoshimoto, 1993 and its related genera in Egira Duponchel, 1845 group. We propose the absence of signum on corpus bursae can be regarded as the synapomorphic character of Lithopolia. Based on this character, we transfer Egira phahompoki Hreblay & Ronkay, 1999 of N. Thailand (type locality) and W. China (new record) to Lithopolia (comb. 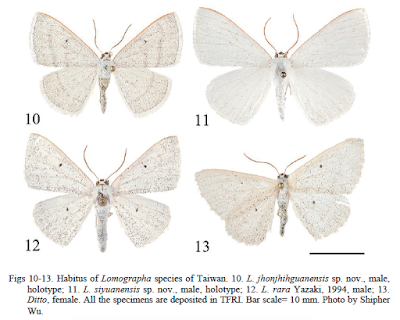 nov.) and describe a closely related new species, L. tadaokanoi sp. nov., from Taiwan. 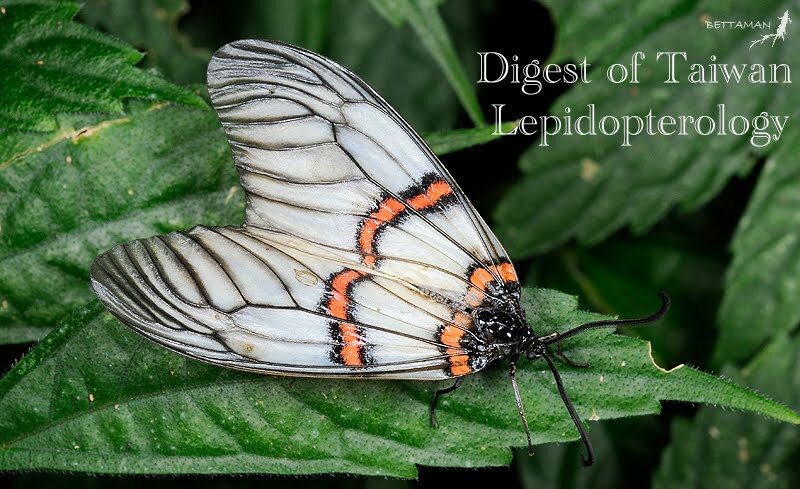 The inner relationship of Lithopolia is also discussed. [文獻來源] Wu, S. 2018. Discovery of the genus Pseudepione Inoue, 1943 in Taiwan, with description of a new species (Lepidoptera: Geometridae: Ennominae). Zootaxa 4486 (1): 96–100. 文獻來源：Wu, S. and W. C. Chang. 2018. 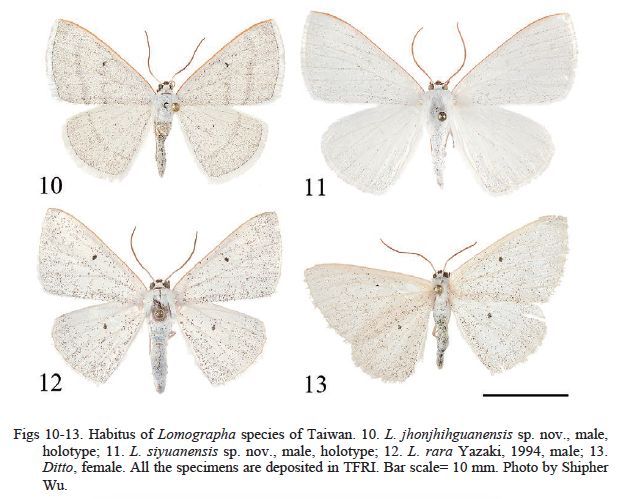 Revising the generic characters of Lobogonodes Bastelberger, 1909, with description of a new species from Taiwan (Lepidoptera: Geometridae: Larentiinae). Zootaxa 4433 (3): 434–444. 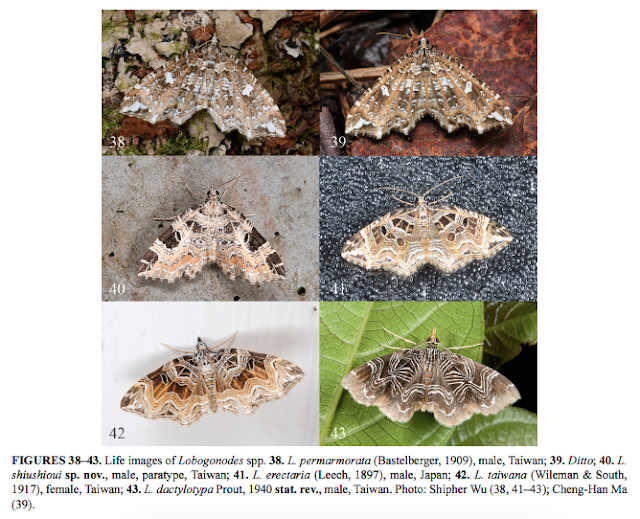 The present study re-assesses the characters of the Oriental genus Lobogonodes Bastelberger, 1909 based on all 8 species, including the newly described L. shiushioui sp. 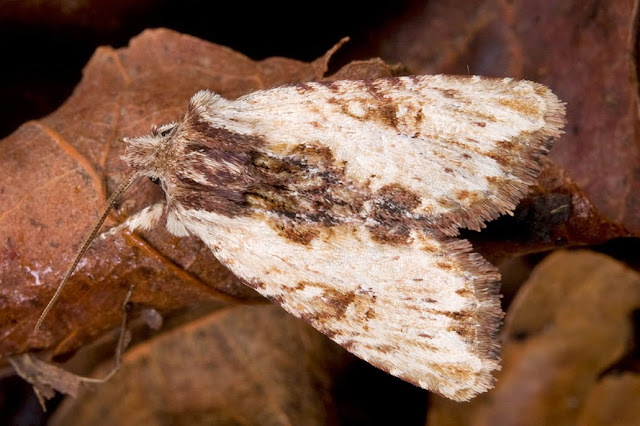 nov. and the distinct species L. dactylotypa Prout, 1940 stat. rev.. Three synapomorphic characters based on the male genitalia are proposed: the presence of a sclerotized subscaphium, the U-shaped connection between the juxta and anellus lobe and the saccus process pointed anteriorly. A new key to the species in this genus is provided. 文獻來源：Description of a new Dypna species in Taiwan (Notodontidae: Spataliinae: Ceirini) with taxonomic notes on some broad sense Bireta species. Tinea 24(2): 109-113. A new notodontid species of the genus Dypna Kiriakoff, 1962, D. yulaonensis sp. nov. is described from Taiwan, with the taxonomic notes on some broad sense Bireta species in the tribe Ceirini of subfamily Spataliinae. The arciform juxta is regarded as the synapomorphic character of Cutuza and Dypna clade, the heterogeneous sclerotized projection of valva can be adopted to separate these two genera. Totally eight new recombinations are proposed, i.e. Dypna rapinae (Schintlmeister, 2008), comb. nov., D. sicarius (Schintlmeister, 2008), comb. nov., D. parricidae (Schintlmeister, 2008), comb. nov., D. extortor (Schintlmeister, 2008), comb. nov., D. theodosius (Schintlmeister, 1997), comb. nov., D. theodosius felicitas (Schintlmeister, 2008), comb. nov., D. dorsisuffusa (Kiriakoff, 1962), comb. nov., C. formosana (Nakamura, 1973), comb. nov. 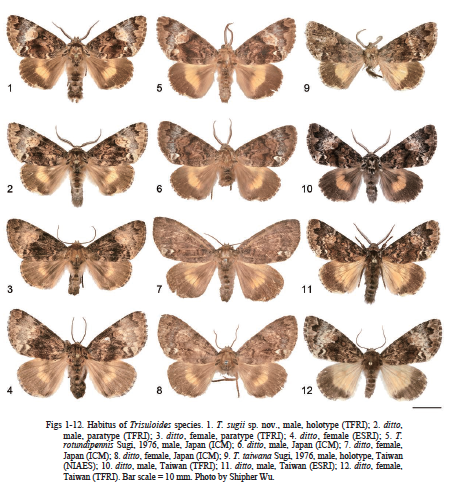 The species Torigea fortis Kobayashi & Kishida, 2008 and Mangea gemina Kishida & Kobayashi, 2004 are transferred back into their original genus, respectively, from Bireta sensu Schintlmeister, 2008 (comb. rev.). 文獻來源：Wu, S & L. C. Shih. 2018. Trisuloides sugii sp. nov., a new species endemic to Taiwan (Lepidoptera, Noctuidae, Pantheinae). Tinea 24(2): 86-92. 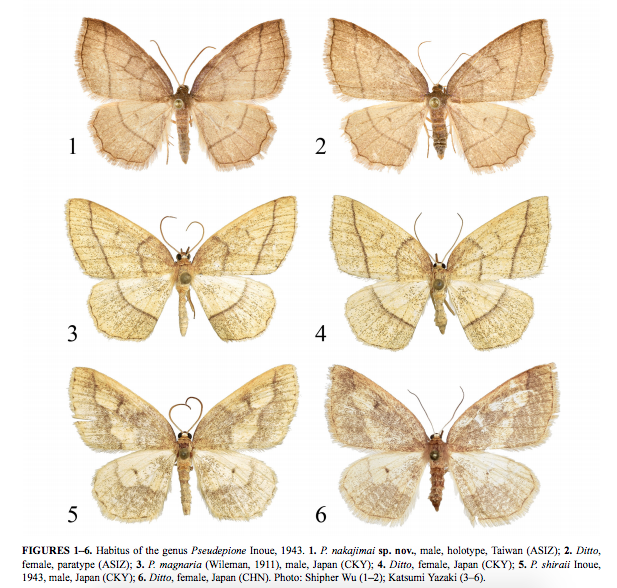 The present study elucidates the taxonomy and distribution pattern of taxa that previously identified as a single species Trisuloides taiwana Sugi, 1976. We prove Trisuloides taiwana only occurs in mid-elevation of central Taiwan and its female genitalia are firstly illustrated and described. The Trisuloides population occurring in the low mountain range of northeastern Taiwan is described as a new species, T. sugii sp. nov.
文獻來源：Wu, S. 2018. 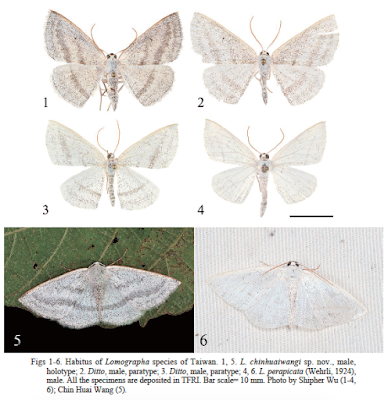 Further study on the genus Lomographa Hübner of Taiwan with descriptions of three new species (Geometridae: Ennominae). Tinea 24(2): 86-92. Three new species of the genus Lomographa Hübner, L. chinhuaiwangi sp. nov., L.
jhonjhihguanensis sp. nov. and L. siyuanensis sp. nov. are described from Taiwan. The female of L. rara Yazaki, 1994 is first described and illustrated.